Ravenscar on the east coast of North Yorkshire is a varied costal area with natural history and industrial archaeology interest especially in the alum works. Alum shale quarried from the hillside was used in liquor production at the site from 1650-1860 for use in dyeing and tanning leather. The Natural Trust has a group of properties extending along the coast from Saltburn to Filey. The Cleveland Way runs along the cliff top to Whitby giving beautiful views and many forms of wildlife from meadow flowers, orchids, woodland, coastal heath, cliff grassland to nesting birds. A Boggle is the local name for hobgoblin, the mischievous little people thought to live in caves along the coast, and Boggle Hole was where smugglers used to land their contraband. 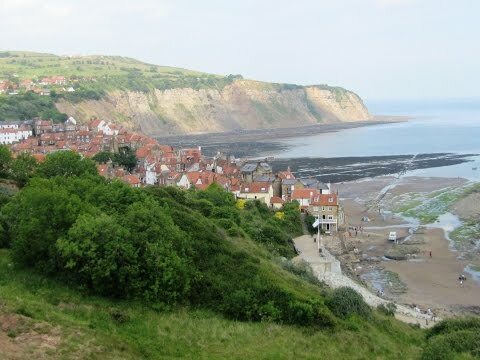 Robin Hoods Bay is one of the most attractive villages along the Yorkshire coast and was once, millions of years ago, a deep sea and the sea animals that were buried in the mud became fossilised and is now one of the best places in Britain for the fossil hunter. There are lots of narrow idyllic alleyways with tiny cottages with their red pantile roofs and a steep main street. Robin Hoods Bay has been an important fishing village since the 1500’s and was, like Boggle Hole, a haunt for smugglers. In the 18th century Robin Hoods Bay was the busiest smuggling community on the Yorkshire coast and the fisherfolk, farmers, clergy and gentry were all involved. It is said that their illegal contraband of rum, brandy and tobacco could be moved through the village via a maze of tunnels and secret passages without seeing the light of day and a bale of silk could pass from the bottom of the village to the top without leaving the houses. There were fierce battles between smugglers and excise men both at sea and on land. The now dismantled railway line which ran from Scarborough to Whitby opened in 1885 and closed in 1965 when Beeching wielded his infamous axe. The railway is now a footpath taking you through some beautiful countryside with deep wooded ravines and under old still standing railway arches. We park at the side of the road near the toilet block at Ravenscar. We walk from Ravenscar to Robin Hoods Bay following the Cleveland Way passing by the disused Alum works (if you wish you can explore these Alum works) and then going steeply down then steeply up at Boggle Hole. Here at Boggle Hole is the YHA and the beach which is sand on one side and pebbles on the other side. On reaching Robin Hoods Bay the sea is a long way out so we take the opportunity to walk along the beach area and look in the rock pools for crabs and signs of any sea life. We walk up the steep main street to the top until we come to a t-junction here we turn left and walk the road, then shortly after passing a large church we take the disused railway track on the left. We now follow the railway track going under a number of old railway arches back to Ravenscar. This is a moderate walk with steep inclines and declines along the coastal path. The railway line from Robin Hoods Bay is slightly going uphill. Ravenscar is on the East coast of North Yorkshire. From York take the A64 to Scarborough then the A171 and take a turning on the right for Ravenscar OR from York take the A19 to Thirsk then the A170 to Scarborough then the A171 and take a turning on the right for Ravenscar. There are public toilets at Ravenscar but no refreshments. There is the Raven Hall Hotel on the top of the cliff and there is a National Trust shop and local exhibition at Ravenscar. At Robin Hoods Bay there are two toilet blocks one at the bottom of the hill and one at the top of the hill. For refreshments there are a few pubs, cafes and shops in Robin Hoods Bay. Hi, we bumped into you last week in Langdale, we were a group of 4, don’t know if you remember us, anyway thanks for your business card. Your web site is impressive! We live in Cloughton and I am familiar with Ravenscar. Re refreshments, there are tea rooms in the Old Station square (seasonal) and Raven Hall Hotel is open to non residents and does a nice afternoon tea.